The medical community is quickly evolving its understanding of menopause. Following the abrupt, early halt to the HRT portion of the Women's Health Initiative last July, due to findings that Hormone Replacement Therapy's risks outweighed its benefits, headlines now read "Menopause is not a disease, but a normal part of life." Hormone "replacement" therapy (HRT) has become simply hormone "therapy" (HT) in recognition of the fact that replacing estrogen is not natural and brings dangerous side-effects, rather than the fountain of youth once touted. Shocking and novel as these concepts may be to today's medical community, they are nothing new to Maharishi Ayurveda, a consciousness-based natural medical system from ancient India. For over 5000 years, Ayurveda has acknowledged menopause as a natural transition, not a mistake of Mother Nature's that requires hormone replacement therapy. Maharishi Ayurveda reassures us that menopause can be health-promoting, spiritually-transforming and free of troublesome symptoms. Health problems at menopause represent imbalances in the body that were already growing in the body and are unmasked by the stress of shifting hormones. Menopause symptoms are Nature's wake-up call to let you know you need to start paying more attention to your health. Age forty-five to fifty-five is a critical decade, according to Ayurveda. It provides the foundation on which your later health is laid. Just like putting money in your IRA, timely investing in your health can dramatically increase your "yield" of healthy years at midlife and beyond. Particularly if you have not been taking care of yourself in your 30's and 40's, making lifestyle changes now is critical to ensuring that you age gracefully without the burden of chronic health problems. While eating a healthy diet and getting enough exercise provides the foundation of good health for everyone, each woman's menopause experience is unique. Symptoms vary from woman to woman. Knowing precisely how your body is out of balance can guide you in selecting the key lifestyle changes you should make to relieve your symptoms. Ayurveda describes that the type of symptoms you have depends upon which bodily principle or dosha is "out of balance" in your mind/body system. V-Type- Prone To Nervousness: anxiety, panic, mood swings, vaginal dryness, loss of skin tone, feeling cold, irregular periods, insomnia, mild or variable hot flashes, constipation, palpitations, bloating and joints aches and pains. P-Type- Prone to Hot Temper: anger, irritability, feeling hot, hot flashes, night sweats, heavy periods, excessive bleeding, urinary tract infections, skin rashes and acne. Ayurvedic Tips: Increase cooling foods, water intake, sweet juicy fruits (grapes, pears, plums, mango, melons, apples,) zucchini, yellow squash, cucumber, organic foods. Go to bed before 10 PM and try to wind down earlier in the evening. Decrease excessive sun and overheating, hot spicy foods, hot drinks and alcohol. K-Type- Prone to Weight Gain: sluggishness, lethargy, weight gain for no reason, fluid retention, yeast infections, lazy, depressed, lacking motivation, slow digestion. Did you know that your ovaries and adrenal glands continue to produce estrogens and "pre-estrogens" after menopause, providing your body with its own hormonal backup system? Ayurveda describes that this hormonal production after menopause will be optimal if your mind and body are "in balance," providing just the right amount of estrogen to prevent hot flashes and keep your bones, skin, brain, colon and arteries healthy without increasing the risk of breast or uterine cancer. Balancing your doshas, as discussed above, is the first approach to ensuring optimal hormone production after menopause, but Ayurvedic herbs can also help. Indian asparagus root (shatavari; asparagus racemosus), thick-leaved lavender (chorak; angelica glauca- related to the Chinese female tonic Dong Quai,) licorice root, sandalwood, pearl, red coral, rose and others are used by skilled practitioners in balanced, synergistic combinations to help relieve hot flashes, libido problems, irritability, mood swings and other menopausal symptoms. Hormonal Help from Plants - It's Not Just Soy! Diet also plays a key role in balancing hormones during and after menopause. It is well known that Japanese women rarely experience hot flashes, probably because their diet contains large amounts of soy, a food rich in certain plant estrogens called "isoflavones." Soy products are not the only source of plant estrogens, however. Another equally healthful source of phytoestrogens are "lignans," compounds found in a variety of whole foods including grains and cereals, dried beans and lentils, flaxseed, sunflower seeds and peanuts, vegetables such as asparagus, sweet potatoes, carrots, garlic and broccoli and fruits such as pears, plums and strawberries. Common herbs and spices such as thyme oregano, nutmeg, turmeric and licorice also have estrogenic properties. It turns out that if you simply eat a varied diet high in fruits, vegetables, whole grains and dried beans you will be ingesting a rich phytoestrogen feast in your daily cuisine! Variety and moderation are important because just as too much estrogen is unhealthy after menopause, too much phytoestrogen may also be dangerous. This danger can be avoided by getting your phytoestrogens naturally from a variety of whole foods, rather than from supplements or concentrated tablets. When You Can't Stop Flashing, Get The "Lead" Out! More serious symptoms, such as frequent hot flashes, continual sleep disturbance, and moderate to severe mood swings, are signs of deeper imbalances that, if left untreated, will persist to set the stage for later disease. For these more troublesome symptoms to manifest, the tissues of your body - your bones, muscles, fat, organs, skin, and blood - must be disturbed in some way. Ayurveda describes that stubborn symptoms are usually due to the buildup of wastes and toxins, referred to as "ama," in your body's tissues. For example, hot flashes that won't go away despite herbs, diet, exercise, and perhaps even HRT usually represent a problem with ama. One of my Ayurvedic mentors explained it this way: When your body's channels are clogged with wastes, the heat from metabolism builds up in your tissues. Hot flashes result from sudden surges in blood flow as the body tries to clear the channels and dissipate the heat buildup quickly. A similar phenomenon occurs when you have a heater set on high in an overheated room with all the windows and doors closed. To cool down the room, first you must turn down the heater (see Tips for P-Type above) but you also need to throw open the windows and doors (as in removing the ama) so the heat can flow out. We can understand this analogy medically in terms of hormone receptors. No matter how much estrogen or phytoestrogen you have floating through your bloodstream, it does you no good unless it connects with your body's estrogen receptors, the tiny "keyholes" on your cells. Estrogen and phytoestrogens fit these keyholes like minuscule keys and through them gain entry into your cells. When the receptors are clogged with debris or "ama," your hormones cannot get into your cells to do their work. 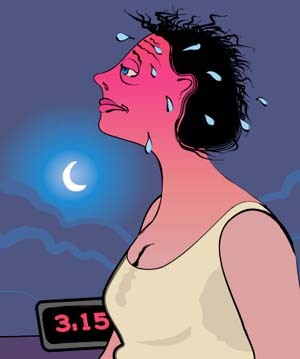 Then bothersome menopause symptoms may persist despite a variety of attempted therapies. In this case, a traditional Ayurvedic detoxification program referred to as Maharishi Rejuvenation Therapy (MRT), or "panchakarma," may be needed to clear the body's channels and gain relief. This internal cleansing approach is also the treatment of choice for more serious problems such as osteoporosis and high cholesterol. A study published in a recent issue of Alternative Therapies in Health and Medicine confirmed that this ancient technology of herbalized oil massage, heat treatments and mild internal cleansing therapies does indeed reduce toxins in the body. Hormone disrupting PCB's and pesticides such as DDT were reduced by approximately 50% after just 5 days of treatment. Other studies have shown overall reduction in health symptoms, a rise in "good cholesterol," and reduction in free radicals from MRT. In my clinical experience, MRT can be very transforming, eliminating symptoms while at the same time dramatically reducing stress and fatigue. After a week of treatment, my patients not only report feeling much better, they radiate health and youthfulness and many experience a profound sense of well-being and inner peace. The important point to remember at midlife is that health problems don't pop out of nowhere when your estrogen levels start to fluctuate and fall off. Rather it is the cumulative effects of damaging lifestyle habits -- late nights, fast food, eating on the run, lots of stress, too little exercise -- over decades that set in motion chronic disease and aging well before menopause. Your symptoms are simply telling you just how out of balance you are. The good news is that with a few basic lifestyle changes, and the healing power of Maharishi Ayurveda when needed, underlying imbalances can be resolved, paving the way for a smooth menopause transition and great health in the years to come.